The long stretch of winter re-runs is coming to a close. 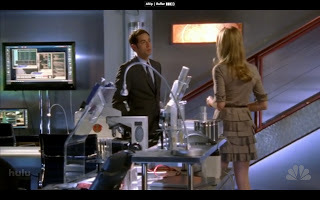 I am thankful because we have not had a new episode of CHUCK since NOVEMBER 29th. That is crazy. As it is I still have to wait a couple of weeks more until January 17th. As I wait for the continuation of the 4th season I thought I would highlight a few more IKEA goodies from the show. At the end of Season 3 the spy base - called Castle - located beneath the Buy More was destroyed when the Buy More exploded. For season 4 we were introduced to a new, shiny castle. We've seen a bit of it in the EMU spotting post back in October. What I didn't mention in that post was all the other IKEA things going on in that photo. You can begin to make out the JANSJÖ work lamps and DACKE shelves. (*Based on shelf count I've determined they are the now discontinued DACKE shelves. 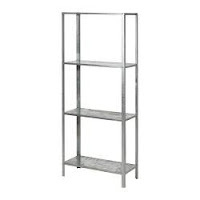 However, they do look like the much cheaper HYLLIS shelves. Either would work.) 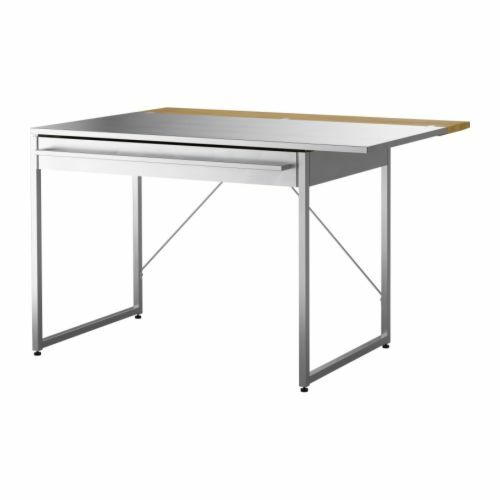 If you enlarge the photo you can see that the work station to her left is actually a DACKE kitchen island (also discontinued). Here is a close up of some of the JANSJÖ scattered throughout Castle. 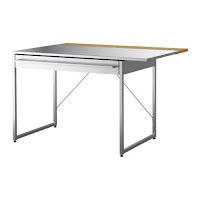 Also, in the image blow I think those are CAPITA legs holding up the shelf on the work table. The DACKE shelves were given a base for stability? height? mobility? I don't know but you can see a close-up here in the left hand corner. And here is a shot of even more shelves. So there you have it. If you want to turn your basement or garage into a top secret spy base the most cost effective way is to purchase the $14.99 HYLLIS shelving unity and add random gadget-y looking things. Adorkable spy with his hot spy girlfriend are optional.